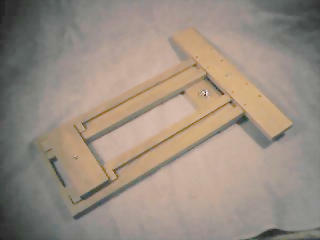 This project started as a bellows folding experiment. The leather/cloth bellows became the core, around which, the camera was built. This camera can be operated as a standard 'lensed' view camera or a 'pinhole' camera. 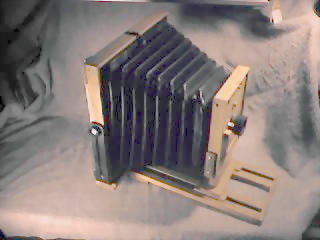 Pinhole cameras are rarely built with bellows as there is only one optimal pinhole diameter for any given 'focal length'. Through the use of a 4-pinhole turret an optimal/near-optimal pinhole can be selected for any chosen focal length. One feature that distinguishes the pinhole camera from its lensed counterpart is that changes in focal length act as a zoom rather than a focus control. This allows the bellows pinhole to operate over a wider range of conditions. 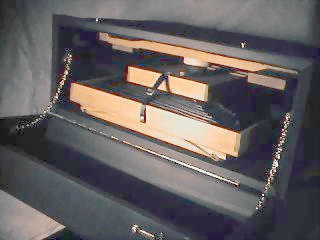 The inner lining of the bellows is book cloth. The outer is very thin, soft leather. Between the layers is a set of cardbaord battens that help to hold the shape and guide the folding process. The camera body is made from oak and basswood. The front end of the camera can 'swing' (for lens work), while the back end has full swing and tilt capabilities. Camera disassembled, in storage case. A special cloth covered, velvetine lined case was constructed for safe camera transport. All hardware is brass. The bellows 'rails' are detached and leather straps keep the bellows collapsed during storage. The camera uses a standard view camera-like lens board. This feature make switching between lens and pinhole functions simple and fast. 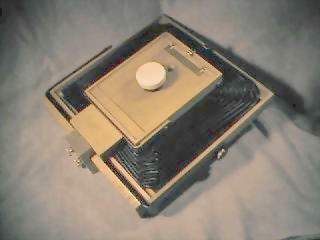 The glove-leather 'lenscap' protects the 1 mil brass pinhole plate and acts as a shutter for the single pinhole turret shown here. The 'ground glass' focussing screen is actually made of acrylic and 'frosted' with 300 grit sandpaper. 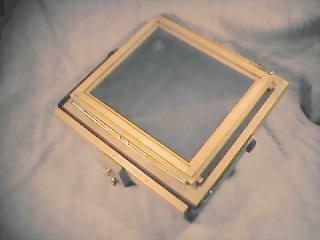 The camera uses standard 8 x 10 film holders which are held in place by brass leaf springs connecting the pressure plate to the camera body. In bright daylight, the scene is easily framed using the focus screen. 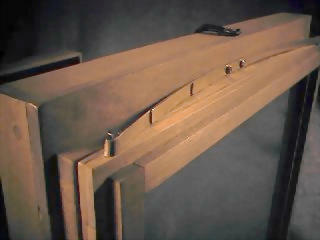 For strength, the bellows 'rails' are made from oak. This assembly also acts as the tripod mount point. Small marks placed along the track indicate the proper pinhole to be used (when used with the multi-pinhole turret). As mentioned, the multi-pinhole turret allows the user to selct the best pinhole for any given 'focal length'. 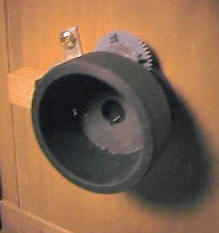 The thumbwheel at the top of the turret is the pinhole selector and the assembly to the left is a release cable mount point for the built-in shutter. Film carrier retaining spring detail. This is a close-up view of the film carrier pressure plate and leaf spring assembly. Brass has sufficient 'memory' to act like a spring while maintaining excellent torsional stability. If you're interested in Pinhole photography, Eric Renner's Pinhole Photography book is indispensible!